A label printer is a computerised device that prints on self-adhesive label sheets and label material. Label printers are typically designed to be connected to a computer that has the software necessary to make up the label print. This is different to a label maker which comes equipped with a keyboard and software and can work as a stand-alone device to print onto labels. How do Label Printers Work? In order to explain how label printers work it is important to distinguish between the two types of mechanisms used for printing onto labels. These are Direct Thermal and Thermal Transfer. Direct thermal uses heat sensitive paper to print onto labels and does not use any ribbon. These labels can generally only be printed in black, unless special pre-printed paper is used, and have a maximum shelf life of a year. These are therefore most popularly used in the foods industry where fresh produce is transported quickly and stored away from heat and sunlight as the labels have a tendency to fade over time. A thermal transfer uses a carbon ribbon and heat to transfer ink from the ribbon to the label for permanent printing. The ribbon can be any colour so the print is not limited to black. Generally these labels are more robust and less light sensitive so are used in cases where longevity is important such as barcodes, outdoor labels and shelf marking labels. The thermal printhead is made up of many tiny heating pins which each represent a pixel. Wax or resin based ink is then loaded to the printer in the form of a ribbon. This ribbon is then drawn through the printer between the paper and the printhead. Signals from the computer are sent to these printhead pins to either heat or cool them which then melt the ink onto the blank label surface to create the required image. 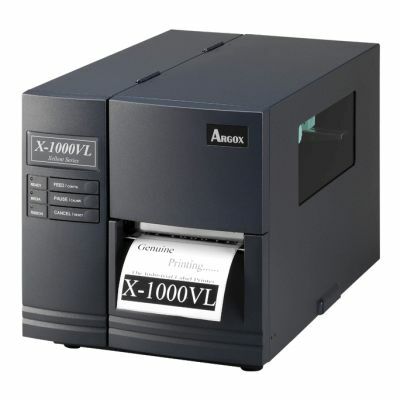 There are a variety of types of label printers that alter in their offerings depending on what they will be used for. Various types include desktop label printers for small to medium label printing needs, commercial label printers for medium- volume label printing and industrial label printers used typically for heavy-duty continuous operation. A variety of industrial label printers include portable printers which can be used on-site such as in the construction, engineering and mining sectors.